A number of Harambee Stars players had to be persuaded to board the Ethiopian Airlines plane to Accra, Ghana for this weekend's international game against the Black Stars, Nairobi News understands. Victor Wanyama and Co. will on Saturday face Ghana's Black Stars in the ultimate 2019 Africa Nations Cup qualification match at the Accra Sports Stadium. 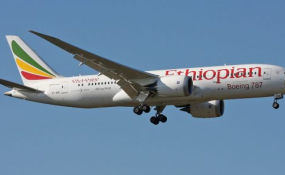 The team left Nairobi for Accra on Thursday morning aboard Ethiopian Airlines but Nairobi News understands that the players would have preferred to use another airline. "Two senior players asked the federation to change the airline but it wasn't possible. It was late and there were no finances. Ethiopian Airlines provide the cheapest option by the way," a source explained. Further, Western Stima Chairman Laban Jobita, who is the Stars' head of delegation for the Ghana trip, posted a message on his Facebook page suggesting that he had to be convinced "it will never happen again", before he could board the Ethiopia Airlines flight. He also explained in the same post that he only boarded the flight 'shingo upande' and 'for the sake of his country'. It was not immediately clear to Nairobi News why the Stars preferred a different airline but initial suggestions are that it could have something to do with the recent air crash involving the airlines' Boeing 738 Max 8 plane, which left everyone on board dead. Meanwhile, the government of Ghana has promised each player Sh1 million if they beat Kenya on Saturday. Both Kenya and Ghana have qualified for the Africa Cup of nations set for July in June, but are required by law to play in this last match of the qualification campaign. Stars are missing the injured Micheal Olunga and Ayub Timbe.